Leaving Budapest felt very strange. One would think that after three months of traveling, departing and arriving would be as natural as eating breakfast in the morning. But the city had drawn me into its quirky energy, so much so that constantly discovering a new, completely different and uniquely beautiful aspect of the city everyday even became familiar. Over a period of two weeks, I had developed a routine that seemed so natural, it felt as if I had done it for years. My mornings began with the fresh, warm croissants lined along the counter of my local coffee shop, filling the small space with an aroma so captivating that my cappuccino would always be accompanied by one of these fluffy pastries as I sat outside in the crisp autumn mornings. 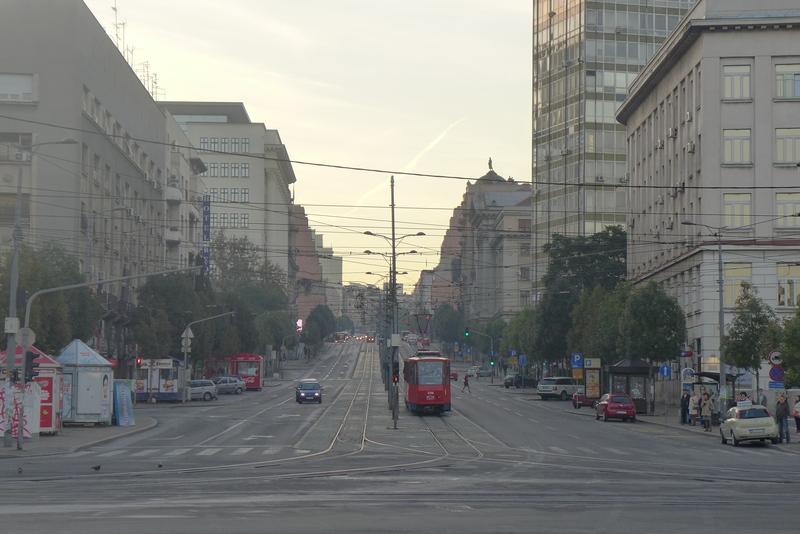 The familiar faces that populated Nagymező utca during the day would bare the same, welcoming smiles when spotted through the crowds of young Hungarians and tourists that flooded into the bustling street each night. The laid back environment of Paprika 2, which resembled a university dorm lounge more than a hostel, brought together such a free spirited and vibrant group of travelers, whose laughter and energy was pleasantly contagious. Yet there I was once again, sitting on a long night train, leaving an incredible group of friends and experiences behind as I shuttled through a completely new and foreign land. 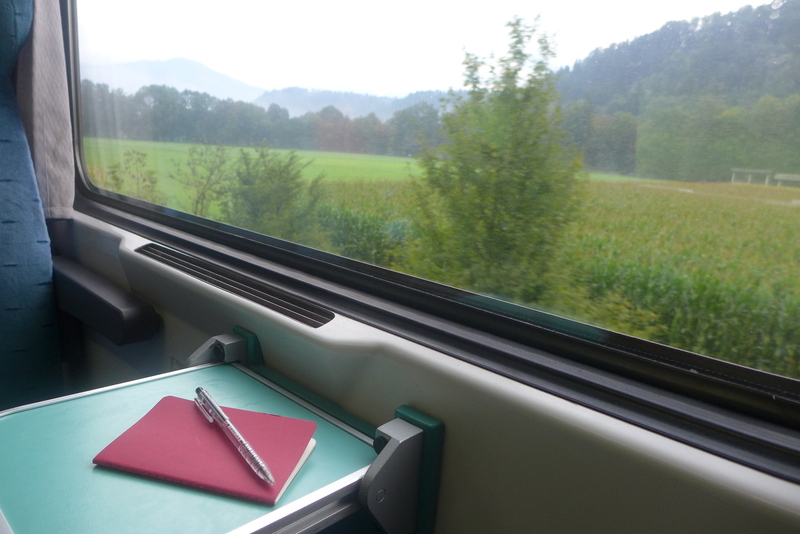 As I reflected on the last two weeks, debatably the most enjoyable of my trip so far (although I constantly catch myself thinking this way), I fell into a long, quiet sleep on the cold train floor, disturbed only once by the Serbian border officials at 2 in the morning. 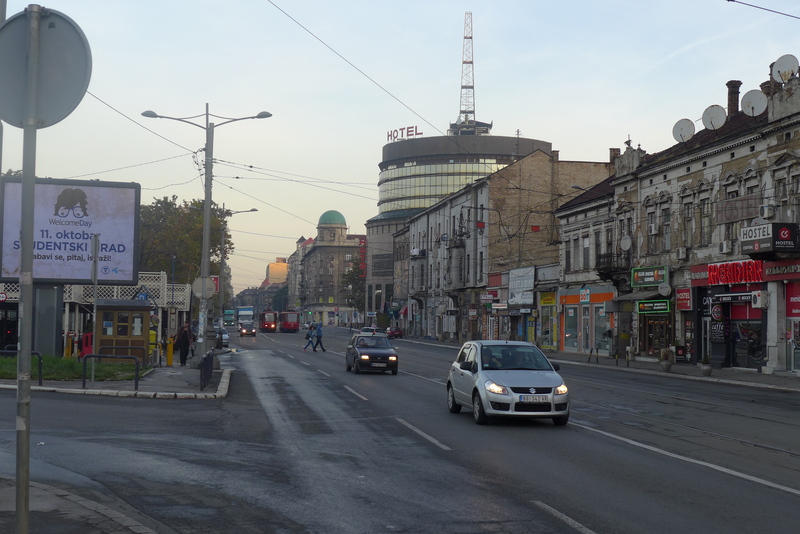 The train dropped me off in Belgrade at 6:30 a.m., on my 100th day on the road. As I adjusted my eyes to the light and dug through my backpack to find my only semi-thick layer, I suddenly felt a rush. A thrill. An inexplicable joy. There I was once again, at the footsteps of a completely new and fascinating city. Everything was different. Faces were unfamiliar, the sounds of the city were distinct, even the air carried a fresh smell that only comes with new arrivals. Again, I caught myself grinning widely, which probably seemed peculiar to the groggy early-risers on their way to work. I was back on the road, and the same feelings I had 100 days prior to showing up in Belgrade were still present, and still as unwilted, refreshing and enthralling. As much as I enjoyed getting to know Budapest, merging with the ebb and flow of the city, and connecting with that lifestyle, there are very few emotions that can compete with those felt upon arriving in a new country with no map, no accommodation, no acquaintances…practically no knowledge whatsoever…and leaving yourself to the flow of time, the spontaneity of getting lost, and the hospitality of a new people. It seems 100 days were not enough to dwindle the excitement of traveling. But surely there have been some things that have changed over the past three months, and I will present them here, maybe returning at every 100 day benchmark over the remaining ~350 days or so to observe and compare the evolution of my thoughts and experiences. 35 liters seems to have been a good choice of size for my backpack. As a reference for new followers and a reminder for those who have been on board from the beginning, here is the packing list that I put together for my trip. So far, I have not needed anything more than the items on that list. Although all of my socks have worn out and I lost a belt along the way, those were quick replacements, and hygienic products are constantly being restocked as well. Another item that will need to be replaced sometime soon, definitely before heading to Southeast Asia in the new year, is my pair of shoes. 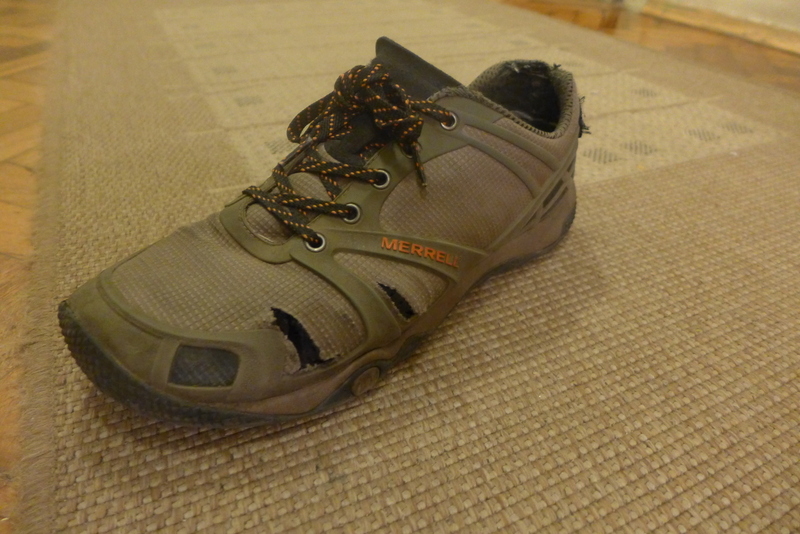 Having bought these sport hiking Merrells with the intention of them lasting 14 months, it seems that these foreboding holes creeping up either side of both pairs will drastically shorten their life expectancy. But for now, they are still performing well and as comfortable as day one, so I won’t worry about them quite yet. Something I did notice, however, was that beyond the possessions that I had, there was still a bit of space in my backpack, allowing for a few additions while still leaving wiggle room in the main compartment. The first addition, which was long overdue, was a moleskin notebook and pen. There have been many instances during my trip where I witnessed a rare sight and consequently had an interesting idea or thought, and having nothing to jot it down in, proceeded to forget on every single occasion. Now, with my handy moleskin, I have gotten into the habit of taking down notes, observations, thoughts…pretty much anything noteworthy that comes to mind. As most can imagine, this has practically taken up zero space, most of the time residing in my pants pocket, which brings me to my second, slightly more bulky addition. 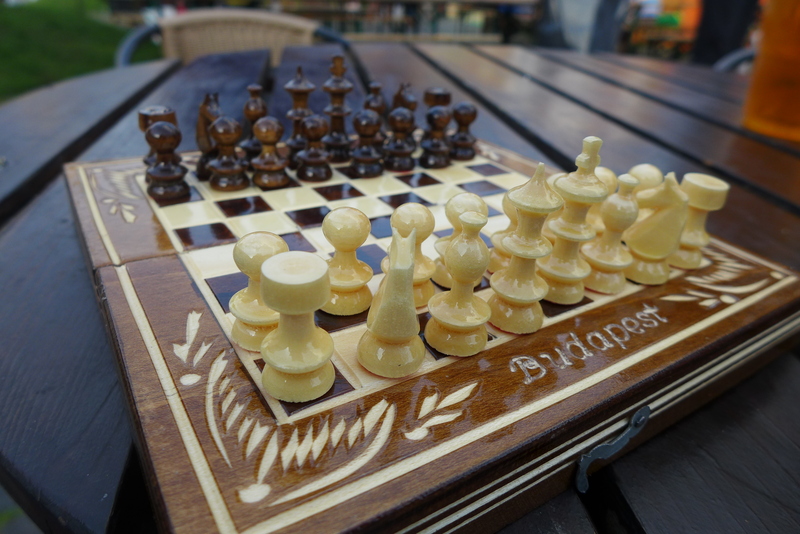 I stumbled upon this beautifully crafted chess set in a market in Budapest, and although I have had a tendency of avoiding kiosks and stores that sell trinkets, gifts and souvenirs, the colors and ornate markings caught my attention. At about 12 cm x 3 cm x 3 cm, when closed, I figured that not only would this inexpensive box take up very little space, but it would also be a nice keepsake that could come in handy in the months to come. And I was right, as within one week of my purchase, I already had the pleasure of using it on five different occasions. Although my pack hasn’t changed all too much, I have recently noticed some changes in myself that have developed on the road. I am a few kilograms lighter, my hair is about 4 centimeters (1.5 inches) longer, and my beard has reached a record 6 centimeters (2.5 inches) in length. But apart from physical attributes, undertaking the challenges of a minimalist backpacking lifestyle allows for the development of new skills, ones that can come in pretty handy. Certain ones I have mentioned in previous posts include uncovering wifi passwords of restaurants, cafes or any other venues without purchasing anything, or finding a nice, cozy and isolated public place to crash for the night, when all else fails. But the one practice that I have developed the most has got to be hand-washing. 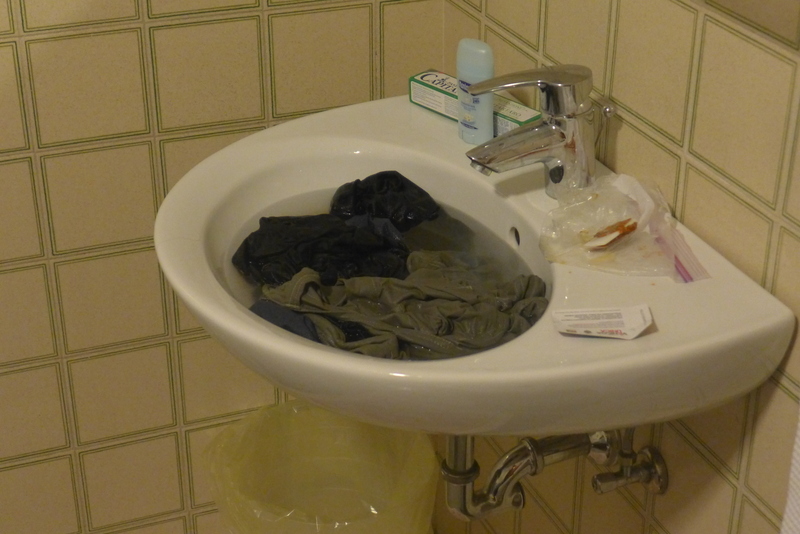 With only a few pairs of shirts, socks and other articles of clothing, limited access to free laundry machines has strengthened my relationship with my bar of soap and any available bathroom sink. At first it was a hassle, and I was never sure how much I needed to wash and soak. But with time the process became increasingly simple, and I began synchronizing soaks with showers and finding creative places for optimal drying (without irritating too many neighbors). The final noteworthy change in my life has been limiting my use of technology. Although I brought along a cell phone, it has been sitting in the bottom of my bag since leaving London one week into my trip. This has been one of the best decisions I have made. Not having the constant, unlimited access to internet and messaging has had a profound effect on my daily activities, allowing for greater involvement in conversations, more time for reading, the opportunity to people watch and admire my surroundings, and asking locals for directions instead of religiously following the monotone, female voice of Google maps. When necessary, the tablet comes in handy for writing, directions, information and getting in touch with people. But at all other times, it remains stored away as well. This is a habit I would like to continue throughout my remaining travels, and hopefully beyond. All in all, not much has changed. The road still holds many surprises in store, and apart from a plane ticket I just purchased from Albania to Italy for the end of October, where a few weeks of working on an olive farm in Tuscany await me, I still have no plans. Belgrade seems nice so far, so I will stick around for several days, taking it one day at a time and embracing the wonders this beautiful city has to offer. Until next time.. This is a great post! I love the moleskin notebook(I bought one), the sublimation of the cellphone (I haven’t owned one yet), the up of meeting Belgrade (such an important attitude after leaving the many new friends…whom you’ll have forever), and the shoes!! My 85-year-old friend is on his 14th pilgrimage to San Juan de Compostello (14th in less than 10 years!–if the weather is too tough, he comes back here for a few weeks, then goes back to finish. It’s at least a 500-mile walk!) He replaces his one pair of boots as needed. And his feet have increased 1 1/2 sizes. So I think you’re setting a pattern for life! Have a great trip! Thank you for your thoughtful post! It’s funny because over the past few days, I have met quite a few people who have done the same pilgrimage, and it sounds like an amazing and challenging experience, kudos to your 85-year-old friend! Another addition to the endlessly growing bucket list..
An interesting retrospective of all of the lessons learned from your first 100 days of travelling. How fascinating your life has become with all of the details of daily living simplified to the basics. I guess that this life will give you some ideas of what you will want to do differently when you come back to the ” real world”. Of course I am assuming that you will come back, which may not be true……. I have read that what makes for happiness in people are their friendships and interactions, not their possessions and wealth. Sounds like that is what you are realizing in your travels. Hope all is well back on the west coast!